Working with leading corporate partners and member universities, Enactus Italy establishes student programs on campuses across the nation. 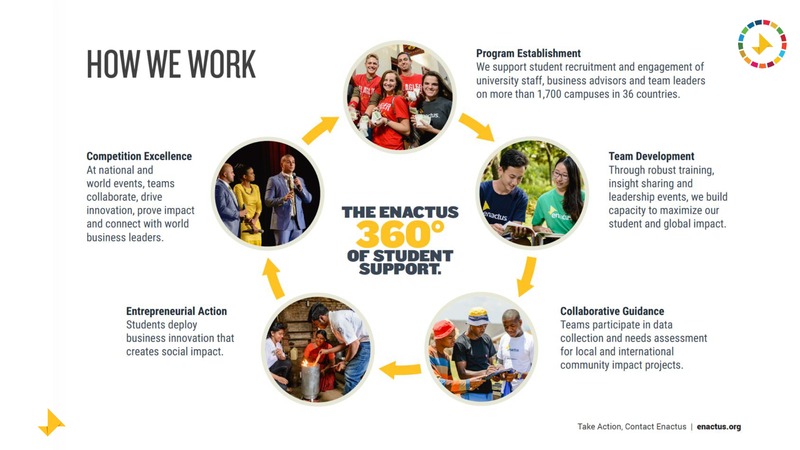 With the support and encouragement of their Enactus advisors and business mentors, Enactus students apply business concepts to develop community outreach projects that improve the quality of life and standard of living for people in need and that are based on the same international criterion. The Enactus program is designed to foster an entrepreneurial approach that encourages creativity and resourcefulness. Enactus teams address a wide variety of issues and rather than mandating a uniform set of projects, teams have the opportunity to work within the Enactus framework while developing projects based on the diverse needs of people in different communities. By using the business concepts they are learning in the classroom to help others, Enactus students develop stronger business and leadership skills, as well as a sense of service and responsibility to the community and world around them. Through their experiences, Enactus students are emerging as leaders who understand the opportunity for business to make a positive economic, social, and environmental impact.